Rare law books often contain much more than meets the eye. Their value lies partly in their individual and particular histories, and the physical features and contexts which bring these to light. Things like bindings, binding fragments, bookplates and other ownership marks, inscriptions and annotations, illustrations, printing history and readership (among others), can provide insights into aspects of history, and legal history, which are understudied or unknown. The Law Library’s rare book collection is a rich source for information of this kind. One – or in fact two – good examples can be found in the catalogue under the title Casus decretorum, held at the library in two early printed editions (Basel, 1489 and Leipzig, 1495-1500). A beautiful image from the first of these books, shown above, was recently chosen for a poster which will hang in the stairwell connecting the Upper and Lower East Side of the Law Library. The image will help guide (and hopefully please) students and researchers going between levels, while the book itself is a study in navigating legal texts. The Casus decretorum is a 13th-century gloss, or set of short, explanatory comments, on Gratian’s Decretum, one of the fundamental texts of canon law. The work was a revision by Bartolomeo da Brescia (d. 1258) of glosses written by a canonist named Benincasa da Siena (d. 1206). Slightly later, Bartolomeo revised the work of Johannes Teutonicus to create the standard gloss on the Decretum, the interpretative text read alongside the Decretum for centuries by European law students, jurists and clergy. The Library’s first printed copy of the Casus decretorum (1489) is a first edition, complete with original wooden boards. Not uncommonly, the Casus is bound with other teaching texts in the same book, and would have been particularly useful for young students: included are the Syllogianthon of Lodovico Bolognini (Bologna, 1486) and the Margarita decreti of Martino Polono (Martinus Polonus) (Strasbourg, 1489). There are truly unique features of the Casus decretorum. Opening the book, the reader can find medieval manuscript pastedowns, or leaves of parchment (generally calf/cow, sheep or goat skin) attached to the inside of the boards (see image below at bottom). The parchment leaves were likely used to protect pages from the wood. The manuscript written on them dates to about 1175-1250CE, and features texts of readings for two masses, both feast days of saints. The feast days also relate to luck and protection – which may be one reason they were chosen to protect this particular book. The parchment is fading, but the manuscript ink is probably as clear as when it was written, some 800 years ago. The reader can also find leather tabs glued to the edges of various pages. 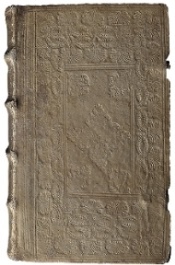 Each title in the book is keyed with a leather tab, and these can be found on other pages as well (the Syllogianthon is tabbed at its index, for example). Some tabs may indicate sections that a 15th- or 16th-century reader used frequently – but it is a question for further study. Convenient navigation is essential for law books. This is true for these texts as well, particularly because they were most likely used for basic teaching or easy reference. The Casus decretorum and Syllogianthon are organized according to the divisions in Gratian’s Decretum, while the Margarita decreti is itself a topical index to the Decretum. To help with navigation, all the texts are rubricated, a technique of adding colors – originally red – in order to emphasize certain words and passages. Although the texts are printed, the rubrication on them is done by hand, sometimes in vivid red, blue and green. 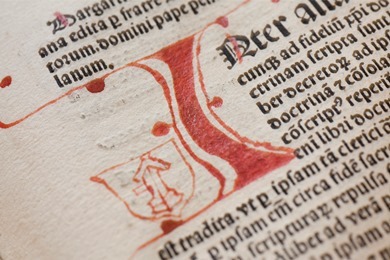 This hand rubrication is also typical of incunables, books printed before 1501. In the Casus and Syllogianthon, colored initial letters draw the reader’s eye to each principal division in Gratian’s text. Within each passage, colored markings also guide the reader to important citations. In the Syllogianthon, which provides fuller reference than the Casus decretorum, red, blue and green paragraph marks highlight citations to the standard gloss on Gratian’s Decretum, other passages within the Decretum, Biblical passages marshalled in support of the discussion and Roman law (see image below at left). Some final, and interesting aids to navigation are added by readers themselves. There are annotations, sometimes simply as a note to oneself (a reader sometimes writes “note” in the margins), while in other places there are elaborate manicules, or drawings in the shape of a hand, indicating a notable passage (see image below right). All of these were used – and were needed! – to get through the thicket of material in a typical legal text of the Renaissance. It should be easier to navigate a modern law book, or to get from the Upper to Lower East Side. But if the bright initial “I” from this book can act as a kind of signage, it has done (some of) its job! 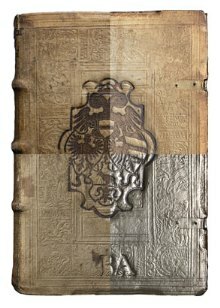 A team of Yale University Library conservators will present “The Surface of Things: Using New Imaging Techniques to Study Bookbindings and Other Cultural Objects” on Wednesday, April 23, 2-3pm, in the Sterling Memorial Library Lecture Hall. They will demonstrate how Reflectance Transformation Imaging (RTI) offers exciting new possibilities for safely capturing a book’s surface decorations, revealing details that cannot be seen using traditional methods or the naked eye. The speakers are Chief Conservator Christine McCarthy and Conservation Assistants Fionnuala Gerrity and Ansley Joe, from Yale University Library’s Conservation & Exhibition Services. The talk, sponsored by the Lillian Goldman Law Library, is in conjunction with a Law Library exhibit, “Reflections on Bindings: Using New Imaging Technology to Study Historical Bindings.” In the exhibit, RTI was applied to the study of bindings from the Law Library’s Rare Book Collection. The exhibit is on display through May 24, 2014, in the Rare Book Exhibition Gallery on Level L2 in the Lillian Goldman Law Library, Yale Law School. From the JP’s origins in criminal law, the office grew to become the most important in local government, with extensive judicial and administrative powers. Although Justices of the peace were drawn from the local elite, few them had legal training. Thus the need for guidance, met by the JP manual. As Parliament frequently changed the duties of JPs, new JP manuals and form books were published with the updated information. JP manuals became consistent best sellers for their publishers. We have covered some of the authors of JP manuals in previous posts on the Taussig Collection: William Lambarde, whose Eirenarcha Is considered the best JP manual of the 16th century; William Sheppard; and Giles Jacob. The boke of iustyces of peas (London: Wynkyn de Worde, 1506). This anonymous work went through over thirty editions in the 16th century, under various titles. It was never adequately updated and soon became obsolete. Anthony Fitzherbert (1470-1538), Loffice et auctoryte des justyces de peas (London, 1538). This is the first edition of Fitzherbert’s popular JP manual, but the only edition in Law French. There were ten editions of English translation, three of which we acquired from Taussig to join the two we already had. The Taussig acquisition also included four of the six expanded editions of Fitzherbert’s JP manual prepared by Richard Crompton. Michael Dalton, The countrey iustice: containing the practise of the iustices of the peace out of their sessions (London, 1619). 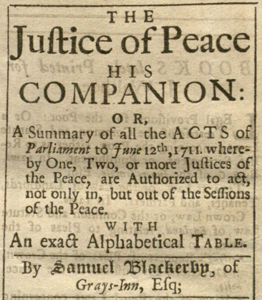 Dalton’s Country Justice went through 20 editions, the last in 1746, and was often plagiarized for other JP manuals. This second edition is one of five we acquired from Taussig. Forms for proceedings on such seizures, as by the late act for preventing frauds, &c. in the publick revenues, are to be heard and determined by justices of the peace (London, 1720). 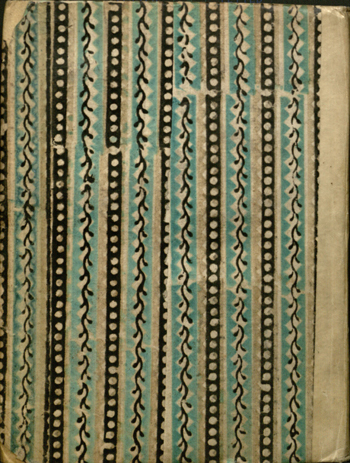 This form book for JPs is one of the rarest items in the Taussig Collection; the only other known copies are at the British Library and the National Library of Scotland. 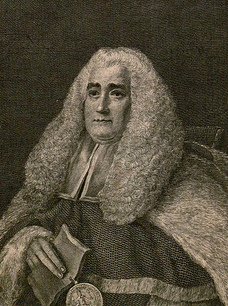 Larry M. Boyer, “The Justice of the Peace in England and America from 1506 to 1776: A Bibliographic History,” The Quarterly Journal of the Library of Congress 34:4 (Oct. 1977), 315-326. W. S. Holdsworth, Sources and literature of English law (Oxford: Clarendon Press, 1925), 126-130. B. H. Putnam, Early treatises on the practice of the justices of the peace in the fifteenth and sixteenth centuries (Oxford: Clarendon Press, 1924). William Sheppard (1595-1674) was born in a small Gloucestershire village on the Severn estuary, where he spent much of his life as country lawyer. However, this did not keep him from becoming “one of the most prolific” legal writers of the 17th century (Matthews, 1984, p. 5) and legal adviser to Oliver Cromwell. In a career spanning more than half a century, he wrote twenty-seven books: twenty-three on such legal topics as property, law enforcement and common law, and four religious tracts (Matthews, 1984, p. 72). Sheppard’s first book, The Offices and Duties of Constables, published in 1641, was a law enforcement manual, in which he expressed his belief that an orderly and ethical society is founded on the character and skills of those elected to positions of authority. His next book, The Touchstone of Common Assurances (1648), was a collection of essays on the law of conveyance and is his best-known work. This book was used by law students and lawyers for the next two hundred years. In 1649, his first religious tract, Of the Foure Last and Greatest Things, was released and was quickly followed by A New Catechism. In Of the Foure, Sheppard, a Calvinist, provided instruction for pious behavior and wrote of his support of the Rump Parliament. In 1651, Sheppard published his first legal encyclopedia, The Faithful Councellor, which was the result of a Rump Parliament edict that all legal records and literature be translated into English. His third religious tract, The People’s Priviledge and Duty, published in 1652, addressed the issue of whether laymen should be allowed to preach; Sheppard argued that laymen should be allowed to preach and called for the repeal of ordinances forbidding it. His religious tracts might have brought him to Cromwell’s attention, which eventually led to his employment as a legal consultant (Matthews, 1984). In the spring of 1654, Cromwell assigned Sheppard the task of formulating a plan for law reform from which was born his most important work, England’s Balme; a collection of law reform proposals. Many of these proposals were presented to Parliament as bills; they touched on such issues as reconstruction of the judicial system, recovery of debt, and improvement of local government. After the publication of England’s Balme, Cromwell promoted Sheppard to Serjeant-at-Law. According to biographer Nancy L. Matthews, this was the “supreme moment of Sheppard’s career in Cromwell’s service” (1984, p. 59). As it stands, the Lillian Goldman Law Library holds a representative sample of all twenty-three of Sheppard’s law books. However, the library lacks twenty or so editions of his books. For instance, the library currently holds eight of ten editions of The Touchstone of Common Assurances. Nancy L. Matthews, William Sheppard, Cromwell’s Law Reformer (Cambridge University Press, 1984). Patrick Little & David L. Smith, Parliaments and Politics During the Cromwellian Protectorate (Cambridge University Press, 2007). Kim Castellano is completing her studies for a Master’s in Library Science at St. John’s University. 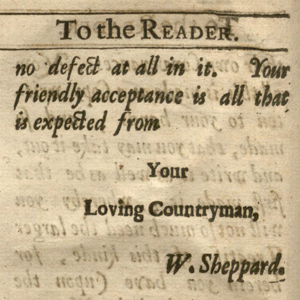 First edition of William Sheppard’s Touch-stone of Common Assurances (London, 1648), his most popular work.